(Nanowerk News) University of Central Florida researchers have shown for the first time that light energy can gently guide and change the orientation of living cells within lab cultures. That ability to optically steer cells could be a major step in harnessing the healing power of stem cells and guiding them to areas of the body that need help. 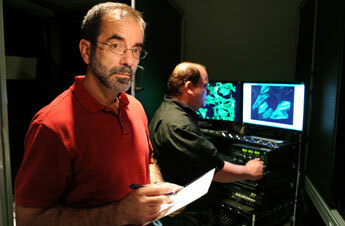 The results, presented at the 2009 Conference on Lasers and Electro-Optics/International Quantum Electronics Conference, were discovered by a research team led by Aristide Dogariu, an optical scientist at the College of Optics and Photonics, and Kiminobu Sugaya, a stem cell researcher at the College of Medicine’s Burnett School of Biomedical Sciences. Long-term implications of the work include stimulating and controlling tissue regeneration for cleaner wound healing and the possibility of altering the shapes of cells and preventing malignant tumors from spreading throughout the body. While optical techniques such as drilling microscopic holes with light or using the light as tweezers have shown promise in manipulating small pieces of matter, the UCF team explored the use of a gentler light energy. Their work showed for the first time that optically induced torques can affect components within cells that drive their motility -- their ability to move spontaneously -- and change the orientation of cells within cultures. While earlier studies of cell manipulation have emphasized shielding the cell from the power of the light, Dogariu and Sugaya focused on using that energy to stimulate the cells’ natural tendencies. Living cells use energy to move actively and spontaneously. To influence them without jeopardizing their chemical makeup was a tremendous challenge. Dogariu and Sugaya began exploring the idea of moving an entire cell by focusing on its inner mechanisms. Inside the cells there are slender rods made up of a protein called actin. “Actin rods are constantly vibrating, causing the cells to move sporadically” Sugaya said. The researchers demonstrated that low-intensity polarized light can guide the rods’ Brownian motion to ever-so-slowly line up and move in the desired direction. A time-lapse video shows that after more than two hours of exposure to light with specific characteristics, a group of stem cells migrates from a seemingly random mix of shapes, movement and sizes to a uniform lineup.